After 40 years as a professional artist and illustrator I realized I had the perfect background and file of designs to create dozens (if not hundreds) of coloring books, pages, cards and even some coloring goodies you can wear and decorate your home with! This is my first book, inspired by the beautiful Sanskrit Mandalas and containing some inspiration to get you started on your coloring journey. Coloring Therapy is the newest form of art therapy and all over the world folks are grabbing back their crayons, collecting coloring books and calming themselves down from the stresses of the modern world for a few hours of "me" time. Coloring is a wonderful way to get back in touch with your inner child as well as a wonderful hobby that feeds the spirit and relaxes the mind. Grab some crayons, markers, pencils, pens or whatever and sit down with the whole family. Coloring is a great form of entertainment that gives hours and hours of family interaction for a very small investment of a coloring book and a box of crayons, gel pens, colored pencils or even pastels. All pages are on a single page, no printing on the back! Give your inner child a play date and the adult in you a peaceful meditation activity. 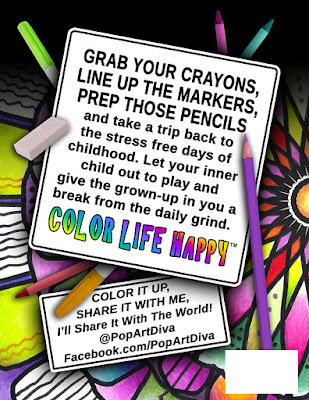 Grab your crayons, line up the markers and prep those pencils and get ready to color your life happy! 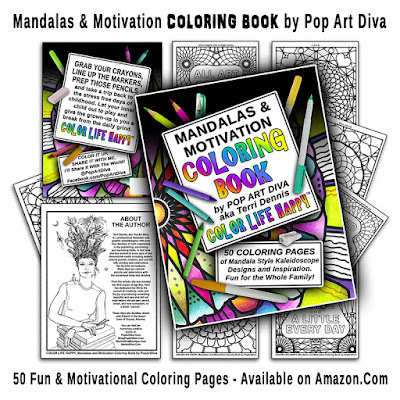 Pop Art Diva's MANDALAS and MOTIVATION COLORING BOOK has 50 fun and entertaining coloring pages featuring mandala style kaleidoscope designs, half of which carry an inspirational message. The designs are perfect for the whole family, adults and children alike, and have simple to medium complexity coloring elements to suit any mood, coloring medium and coloring style. 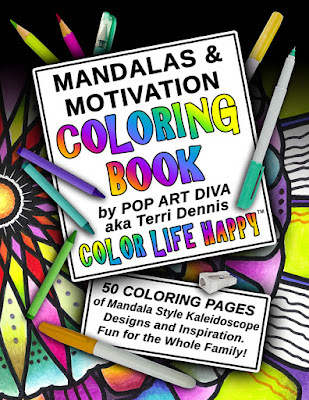 Enjoy hundreds of hours of peaceful coloring, by yourself or with friends and family.